Well, that is how Melissa feels lately, but before she officially cannot move at all we decided to take a trip up to Santa Maria and visit with Melissa's cousins, Heather and Phil. We had not seen their daughter since Christmas-time of 2008! Cozette is getting to be such a cute girl! We'll have to keep better contact with her in the future! After a short drive from Phil and Heather's place we reached San Simeon where there are elephant seals to be found year round! January is kind of a low-key time for the monsterous animals. They were right in between the major birthing season, (though we did see a couple pups who were only an hour or less old), and the mating season, (though we did see some male face-offs and some females who definitely knew how to get rid of unwanted male attention!). ...but all in all there is a whole lot of love to go around! ...and pretty sure this is a position no football-watching guy wants someone to draw a parallel to. 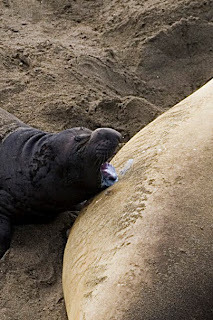 Really though, visiting the elephant seals was cool. The noises they make, their antics, how they move across the sand, (when they actually care to move), was all very fascinating and we took way too many pictures! Before we left, Heather and Melissa had to get a pregnancy shoot together. Now that's what you call a baby bump! 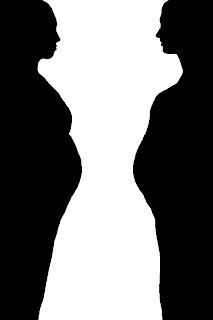 And which do you see - a vase, or two pregnant chicks? Matty, Adam here, just came across your blog and thought I would say congratulations. Looks like you guys are doing well. I gathered from your blog you are living the high life in California. Hope all is well.